Where there's a will, there's a way to make your wishes known. 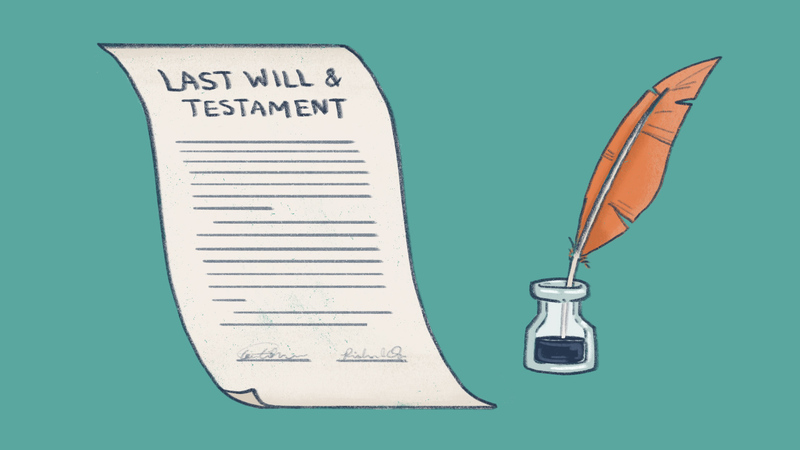 A will is a legal document that transfers your property after you die, and names the people who will settle your estate, care for your children who are minors, and administer any trusts the will establishes. With rare exceptions, a will has to be a formal, written document that meets the legal requirements of the state where it's executed, or prepared. In some circumstances, a hand-written will, known as a holograph, passes muster. In very rare cases—usually a deathbed situation—an oral will, known as a nuncupative will, may be considered valid. But why take a chance? Making a will is one situation where doing the right thing is easy and inexpensive. If you die intestate, that is without a will, you'll have lost control over what happens to your property. And your estate will probably end up paying a lot more to settle your affairs—meaning that less will be available for your heirs. Any estate, large or small, can be settled faster if you've made a will naming the people, charities, or other institutions you want to inherit your property. If you're married and die intestate, your property will go to your spouse and any children you have. Each state has a specific formula for dividing the estate, some giving a greater percentage to the spouse and others favoring the children. If you've been married more than once, or have children from different marriages, the rules for dividing your property could produce results you wouldn't be happy about. If you die intestate, that is without a will, you'll have lost control over what happens to your property. If you're not married, your relatives—the ones the court decides on—inherit. Chances are that what you intended to leave to friends or to charitable, religious, or educational institutions will go instead to a distant relative, perhaps even one you weren't very fond of. The bottom line is that if you're unmarried, childless, and without property, you can justify waiting to make a will. Otherwise, you can't. Any property that is transferred by will is subject to probate, the legal process of proving, or verifying, your will through the courts. Because the process can be slow, costly, and sometimes perverse, probate has a bad reputation. However, you can't avoid probate even if you don't make a will. The only thing you accomplish is to give the probate court—sometimes called surrogate's court or orphan's court—more authority over your affairs, since the court will appoint an administrator to handle your estate. A clear, unambiguous will has the best chance of surviving the probate process without hassle or extra expense. And the more property you have already transferred directly to your beneficiaries, the more you reduce potential problems. In recent years, some people have opted for a living trust to transfer the bulk of their property outside the probate process. But you still need a will to leave property that isn't covered by the trust and to name an executor for your estate and a guardian for any minor children. You can't leave jointly owned property to someone other than your joint owner. If you have a joint bank account with one of your children and own your house jointly with another, that property is theirs when you die—whether or not the properties are of equal value. If your will states that your children should share your estate equally, but all your property is jointly held, your wishes can't be carried out. In fact, if one child generously equalizes her share of a $300,000 inheritance with her sibling, she'll be making a potentially taxable gift of $150,000. If you die without a will and have no relatives, your estate is escheated, or turned over, to the state where you live. That's probably how your friends will feel. More than half of all Americans die intestate, including many who leave a large estate and minor children. A small percentage of wills are invalid for one reason or another. You can divide your estate pretty much as you wish, though there are some things you can't do if you want your will to survive a court challenge. You can limit the inheritance to one or more of your children or, in most states, leave them nothing at all. But it's better to say so directly in the will. If you don't mention them, they might claim you simply forgot, or the laws in your state might say that children who aren't named in the will are entitled to a share of the estate, just as if you'd died intestate. You can specify whether your heirs' heirs inherit their share if the people you name die before you do. In some states, you can include an in terrorem clause that provides that anyone who contests your will loses whatever legacy you had provided for them. However, the court could rule there was a legitimate reason for challenging the will. You can add a legally executed codicil, or amendment, to your will to add, remove, or change beneficiaries or bequests. No state lets you disinherit your spouse, as long as you're legally married, unless there's a legal pre- or post-nuptial agreement. Most require you to leave a certain percentage of the total estate. In fact, a surviving spouse has the right to elect against a will. This means rejecting the terms and bequests of the will and taking instead the minimum percentage that state law sets as the spouse's share of the estate if there were no will. Louisiana won't let you disinherit your children. Several other states make it hard. You can't impose conditions on your heirs that are either illegal or against public policy. For example, if you tie an heir's right to an inheritance to a restriction on getting married or membership in a certain organization, your will might be successfully challenged. You can't write in changes or cross things out of the will after it has been signed and witnessed. Illness can befall anyone, but if you have a plan in place for those circumstances, you can rest easier.